Today at Cartoon Brew there was an announcement about new developments for the much-anticipated upcoming Ratchet & Clank feature film. (Based on the popular Playstation video game series. Do we even need to say that?) Now the film has a distributor (Focus Features, also the home of Laika films) and a planned release date: April 29, 2016. Which is close to the time that Insomniac Games plan to release a new Ratchet & Clank adventure for the PS4. “The movie will be directed by Kevin Munroe (TMNT) and co-directed by Jericca Cleland. The film’s voice cast, also announced this week, includes Paul Giamatti, John Goodman, Rosario Dawson, and Sylvester Stallone, with Ratchet, Clank, Nefarious, and Captain Qwark voiced by the same actors as in the games. 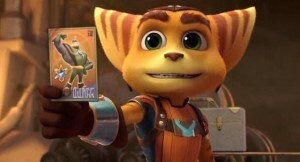 The script was developed with former Insomniac Games and Ratchet & Clank senior writer T.J. Fixman, with original Ratchet & Clank character designer Dave Guertin and weapon/vehicle designer Greg Baldwin also working on designs.” In other words, they’re putting a lot of effort into this thing! Wait. Isn't Kevin Munroe also doing the Sly Cooper movie? In 2016? Uh, unless they plan on just pointing a camera at a running PlayStation, 2015 is going to be a busy year.